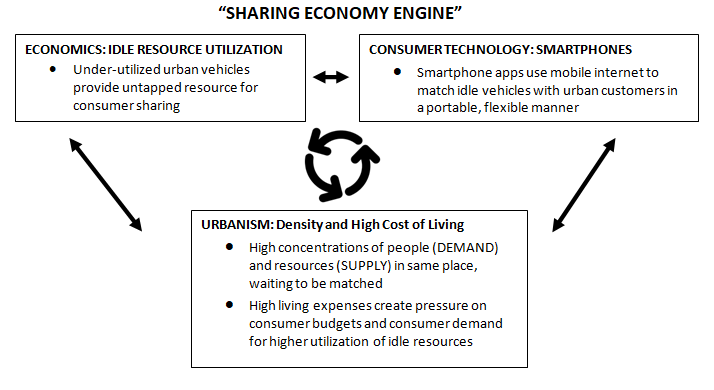 The sharing economy is built on three pillars: Excess resource capacity; mobile internet (smartphones); and urbanism. 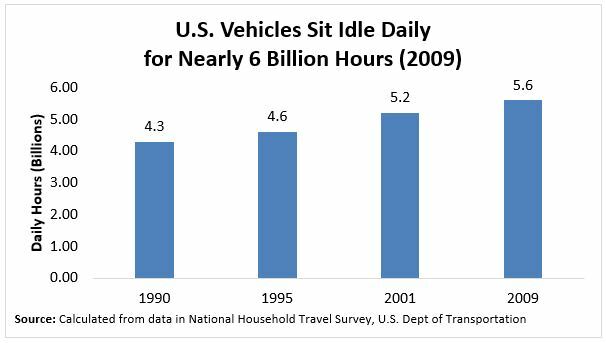 Most vehicles sit idle nearly 23 hours per day, and vehicles in use have nearly two billion empty seats daily. This article is the first in a 3-part series. Future articles will portray the other two pillars. What defines the sharing economy? What forces have facilitated the rise of Uber, Lyft, Zipcar, and similar companies which offer new forms of shared transportation, mostly in urban environments? Researchers such as Zipcar co-founder Robin Chase, in Peers Inc.: How People and Platforms Are Investing the Collaborative Economy and Reinventing Capitalism (2015), or Rachel Botsman and Roo Rogers in What’s Mine Is Yours: The Rise of Collaborative Consumption (2010) have tried to define the sharing economy. These authors tend to converge on a three-way “engine” where supply and demand of idle excess capacity (pillar #1) is coordinated by smartphones (pillar #2) in dense urban places (pillar #3). Each of these three pillars of the sharing economy, as they pertain to ride-sharing and vehicle-sharing, will be examined in-depth in articles in The Fuse. 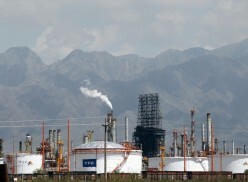 In the current article, idle resource utilization will be the main focus. The raw supply of idle space for vehicle trips strongly suggests that, at least in theory, ride-sharing could grow even further, which in turn would likely reduce vehicle travel and fuel consumption. With respect to idle-resource utilization, little effort has been made to quantify just how much idle space in vehicles actually exists, even as authors have articulated its general relevance to the sharing economy business model. 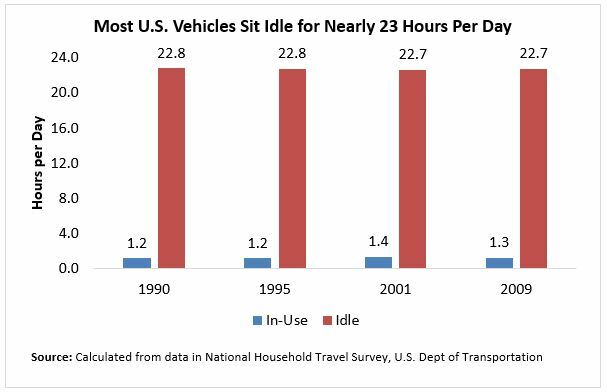 Yet ample data exists, to demonstrate the massive amount of idle resource capacity which does in fact exist in terms of idle vehicle-hours and empty vehicle seats. Both of these factors could lead to increased ride-sharing levels well above what is currently seen even with Uber and Lyft’s remarkable growth since the early 2010s. The relevance of identifying ride-sharing supply, for reducing fuel consumption and alleviating petroleum dependence, is clear. The raw supply of idle space for vehicle trips strongly suggests that, at least in theory, ride-sharing could grow even further, which in turn would likely reduce vehicle travel and fuel consumption. There is an enormous amount of idle vehicle-hours per day—nearly 6 billion daily vehicle-hours as of the end of last decade. Since 1969, the U.S. Department of Transportation has administered a national travel survey every 6 to 8 years. Typically based on a “travel diary” completed by an extensive sample size of more than 100,000 drivers, this survey contains an in-depth snapshot of American travel behavior. The key statistic for determining excess vehicle capacity is the average daily time each driver spends in a vehicle, shown below for the four most recent surveys (1990, 1995, 2001, 2009) to track this variable. It is reasonable to assume that, on average, vehicles are idle when a driver is not driving, since America has had more than 1.00 vehicles per licensed driver in each of the survey years. 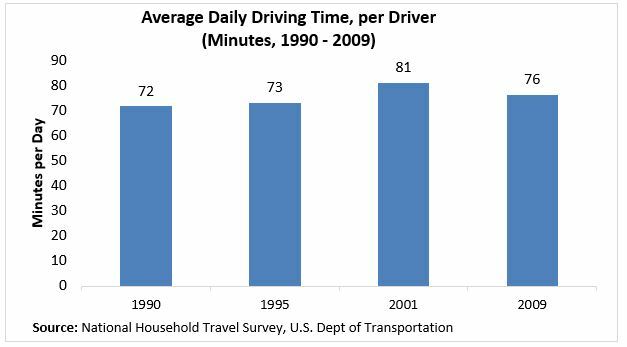 This means that if average daily driving time is subtracted from total amount of minutes in a day (24 x 60 = 1,440 minutes per day), the result is the average daily idle time per vehicle. By this reasoning, most American vehicles sit idle for nearly 23 hours per day. If the above figures are multiplied by 365 days per year, and by the total vehicle fleet (188 million in 1990, 246 million in 2009), the result is an enormous amount of idle vehicle-hours per day—nearly 6 billion daily vehicle-hours as of 2009. If 5.6 billion idle vehicle-hours per day were not enough to indicate sharing economy capacity, looking at the rate of occupancy per vehicle trip can also strongly illustrate idle resources. 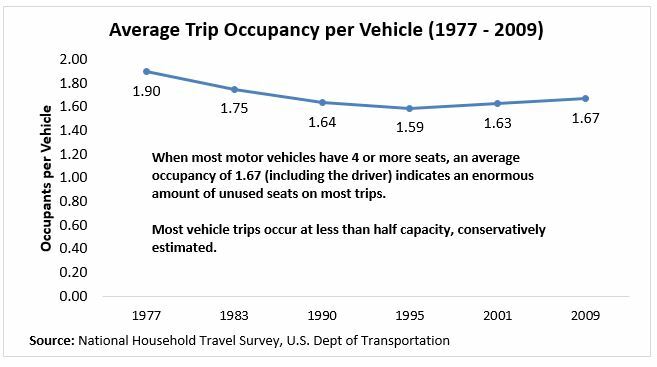 Such a large amount of trips are taken alone that even when including trips with passengers, the average vehicle occupancy rate per trip has long been less than 2.0 per vehicle trip. The household vehicle fleet is overwhelmingly composed of automobiles, SUVs, and light-duty trucks, each of which normally contains four or more seats (including the driver). Therefore, when only 1.67 seats per trip are occupied (including the driver), it means that an enormous amount of vehicle space sits idle, even when the vehicles are in-use. 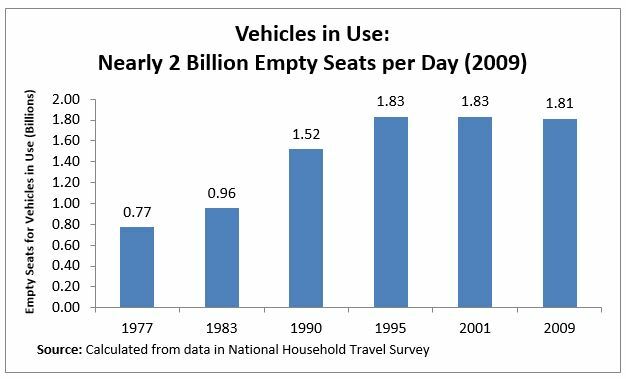 Multiplying the total number of empty seats per trip (assuming an average capacity of 4.5 seats available per trip), by the total amount of daily household trips, yields a daily count of nearly two billion empty seats per day, for vehicles already in use. Supply must match demand. 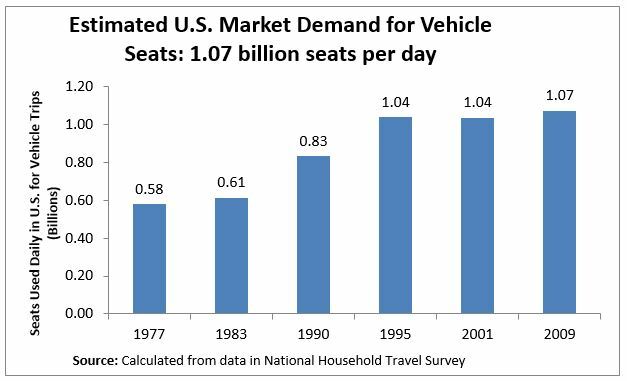 If supply of empty seats could not match amount of trips desired, the ride-sharing economy would not be possible. This begs the question: How many total trips are taken per day, in the United States? 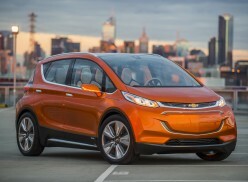 What is total market demand for the seats in motor vehicles? The NHTS measures the average daily person trips per U.S. household. It is important to look at trips per person instead of vehicle trips, because it is people who actually fill the seats. When trips per person are multiplied by the total number of households, the result is total daily trips in the United States. It is important to recognize that the 1.07 billion seats per day, in 2009, represent seats already filled. This means that with 1.81 billion seats open, there is technically room, at least in the aggregate, for every single vehicle trip to include one additional rider, without running out of space for additional riders. Even adjusting for the fact that additional riders may slightly increase average distance per trip, due to added origins and destinations, an increase in vehicle occupancy from 1.67 to 2.67, per vehicle per trip, would still likely lead to a reduction of several hundred billion VMT per year, out of a current annual total of 3 trillion VMT, because the total number of trips would fall so significantly. 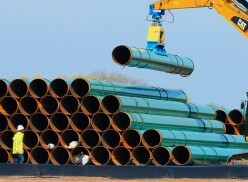 Idle resource utilization is not new. The vast excess capacity of vehicle seats (for vehicles already in motion), in addition to billions of daily hours when vehicles are not in motion and therefore all seats are empty, has existed for the last several decades. Therefore, what has changed in order to make the sharing economy come to life? What has happened, between 2010 and the present, so that robust ride-sharing companies such as Uber and Lyft, have flourished? Companies have operationalized the three pillars of the “sharing economy engine” to match supply and demand with greater precision and flexibility than ever before.